This could be for Google Glass, so you can view information, social networks, websites etc. by doing some sort of eye movements and then be able to close whatever you are viewing in the same way. Though this could also be for a smartphone or even tablet devices as well, with all of the great innovative ways to unlock a smartphone now it only makes sense that some technology would be come available. •Computing system may include a display screen. •The computing system may be in a locked mode after inactivity by a user. •Locked mode of operation may include a locked screen and reduced functionality of the computing system. •The computing system may generate a display of a moving object on the display screen. •An eye tracking system may be coupled to the computing system. 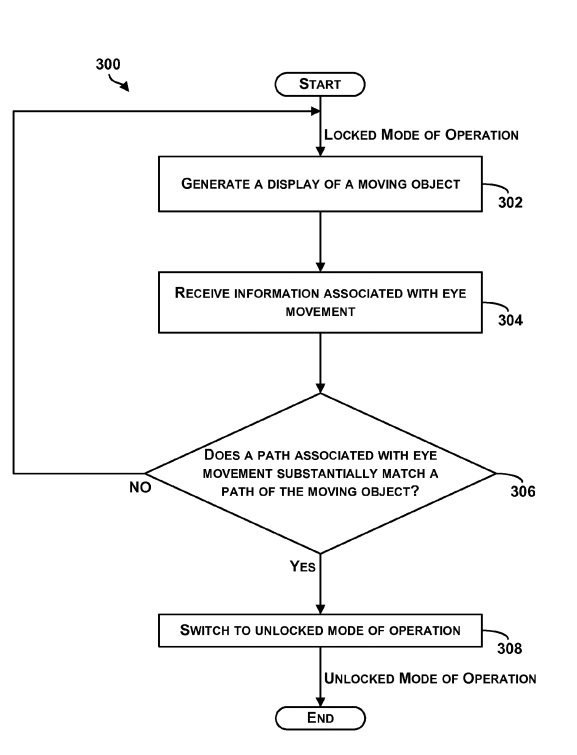 •The computing system may determine that a path associated with the eye movement of the user substantially matches a path associated with the moving object on the display and switch to be in an unlocked mode of operation including unlocking the screen.